The 2017 Speedo Winter Junior Championships – East continue tonight with finals of the 500 free, 200 IM, 50 free, and 4×100 medley relay. One of the swimmers to look out for is Carmel Swim Club’s Drew Kibler, who will take on the 500 free/50 free double. Kibler is the reigning Meet Record holder in the 500 free. Brothers Carson Foster and Jacob Foster will battle it out as the top 2 seeds in the 200 IM. 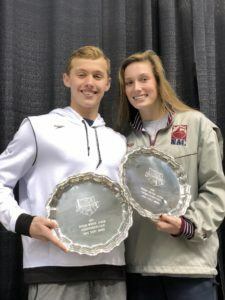 Nashville Aquatic Club’s 14-year-old Gretchen Walsh made history with a new NAG Record this morning and will chase the 22-second barrier in the 50 free. Sister Alex Walsh is chasing her own Meet Record in the 200 IM and will race alongside Gretchen in the 50 free shortly after. Madison Homovich controlled the race through 300 yards, but Leah Braswell turned on the nitrous in the final 200. Braswell pulled slightly ahead with 100 to go, but really broke away with her 54.05 closing split. That was a huge swim for Braswell, who dropped over 4 seconds from her best. Homovich wound up 2nd in 4:41.88. Mary Smutny battled closely with Mid-Michigan’s 15-year-old Lola Mull for the bronze. Mull was a few tenths ahead on the front half, but Smutny made a comeback, speeding up through the final 150 to outpace Mull 4:42.80 to 4:43.35. That time for Smutny was a best by over 3 seconds, while Mull dropped a full second from her former best. SwimMAC’s Olwyn Bartis held off a late charge from Sarasota’s Emma Weyant, 4:46.31 to 4:46.41, for 5th place. Bartis made massive drops today, as her best time ahead of the meet was a 4:57.02. Northern Kentucky Clippers’ 14-year-old Mariah Denigan put up the 6th fastest time of the night from the B final in 4:46.40. Carmel’s Drew Kibler took down his own Meet Record tonight, successfully defending his title. Kibler set the pace early on, trailed closely by Trey Freeman. In the final 100, Freeman started to make his move, but Kibler’s lead was too big to overcome as he won in 4:14.42 to Freeman’s 4:15.06. That was a new best by almost a second for Kibler and a best by nearly 2 seconds for Freeman. Before today, Kieran Smith had never broken 4:20. Tonight, he dropped his best down to a 4:16.96 to take the bronze. Hickory Foundation’s 16-year-old Ross Dant, the youngest in the field, joined them under 4:20, touching in 4:18.89 for 4th place. Dayton Raiders’ Cody Bybee rounded out the top 5 in 4:20.97. SwimAtlanta’s Jacob Magahey was actually slightly faster than that with a 4:20.83 to win the B final. Olivia Carter took the lead up front, putting up a blistering 24.48 fly split en route to her 53.06 at the half. Meet Record holder Alex Walsh was waiting in the wings, however, and made her move to run Carter down on the breast leg. Walsh outsplit Carter by 2 seconds on that 50, and continued to build her lead with a 26.44 closing split to win it in record time with a 1:54.02 to Carter’s 1:56.83. That knocked close to a half second off Walsh’s best and was a best for Carter by a second. 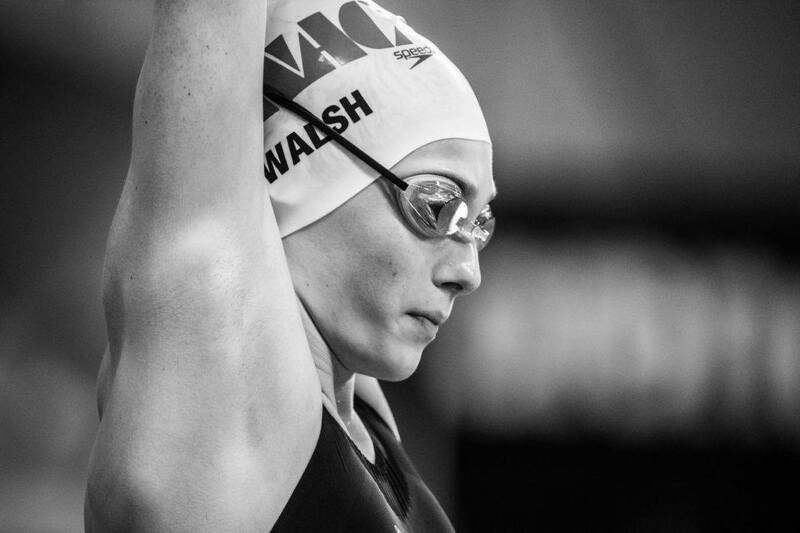 That time by Walsh was a new 15-16 NAG Record, taking down the nearly 10-year-old former record of 1:54.03 set by Dagny Knutson back in 2008. Kelly Pash clipped her best time by a couple of tenths to take the bronze in 1:58.02, using her front half speed to take the edge over Chelsea Piers’ Kate Douglass (1:58.12). Nashville Aquatic Club teammates Ella Nelson (1:59.39) and Allie Raab (1:59.58) battled it out for 5th, with Nelson holding off Raab. 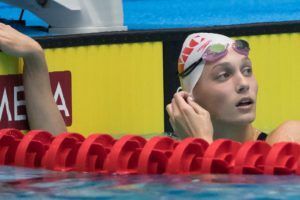 Dynamo’s 15-year-old Tristen Ulett had the 5th fastest time of the night with her 1:58.50 from the B final. Ulett took nearly 3 seconds off her time today. 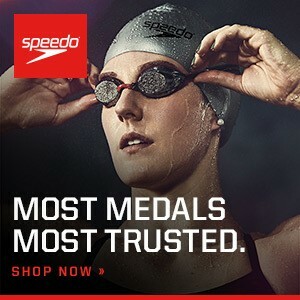 SwimMAC’s Julia Menkhaus had the 6th fastest time of the night with a 1:59.22 for 2nd in the B final. Teammates and brothers Carson Foster and Jacob Foster had a close race to the end. Fresh out of the 500 free, Kieran Smith actually had the early lead, but couldn’t keep up with the Foster brothers through the breast leg. Carson was almost a second faster than Jacob at the halfway mark, but Jacob pushed ahead on the breast leg to take the lead. Carson roared back on the free leg to take the win in 1:43.79, while Jacob was just tenths behind in 1:44.15. Not far behind was Smith, who held on for 3rd in 1:44.34. Bolles’ Dillon Hillis and Pleasantville’s Destin Lasco battled for the 4th spot. Hillis was over a second ahead on the front half and held off Lasco into the finish. Hillis touched 4th in 1:46.22, while Lasco rounded out the top 5 in 1:46.90. Gretchen Walsh came as close as she could get to breaking the 22-second barrier, once again taking down the 13-14 NAG Record as she touched in 22.00. Notably, Walsh’s time, hought a 13-14 NAG, is 4 hundredths faster than the NAG for the 15-16 age group. Kate Douglass picked up silver in 22.18, just out-touching Gretchen’s sister, Alex Walsh. After winning the 200 IM just minutes earlier, Alex took bronze in 22.28. Marlins of Raleigh’s Grace Countie was just off the podium in 22.50. 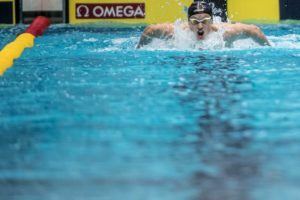 15-year-old Gabriela Albiero of Cardinal Aquatics rounded out the top 5 in 22.74, out-touching Gator Swim Club’s Talia Bates (22.76) by 2 hundredths. Condors’ Christiana Regenauer tied Bates for the 6th fastest time of the night with a 22.76 from the B final. Drew Kibler was back at it again, showing off his range with a victory in the 50 free shortly after he won the 500 free. This time, he got his hand to the wall ahead of Jack Franzman at the finish, touching in a personal best 19.57 to Franzman’s lifetime best 19.74. SOLO’s Matthew Yish nearly joined them below 20 seconds, as he touched in 20.00 to round out the podium. Yish dropped almost a half second from his best today. Cincinnati Marlins’ Justin Grender out-touched Allegheny North’s Mason Gonzalez, 20.12 o 20.15, as they rounded out the top 5. Mason Manta Rays’ Carson Foster came right back to the pool after the 200 IM win, taking 6th here in 20.25. Tying Grender for the 4th fastest time of the night was Rapids Area YMCA’s Henry Schutte, who put u a 20.12 to win the B final. 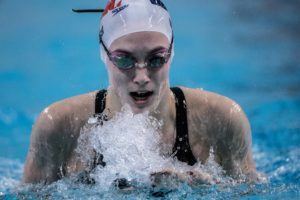 The NAC team of Alex Walsh back- 52.66), Allie Raab (breast- 1:00.98), Ella Nelson (fly- 55.23), and Gretchen Walsh (free- 47.81) swam to victory in 3:36.68. Cardinal Aquatics came in closely behind, highlighted by a 53.44 back split from Krista Wheeler and a 48.87 anchor split from Gabriela Albiero. SwimMAC rolled in at 3rd to round out the medals, with Olwyn Bartis (49.31) giving them a sub-50 anchor split. The Mason Manta Rays came within 3 tenths of the Meet Record in this relay. Carson Foster led off with a 47.44 back split, followed by teammates Jacob Foster (breast – 52.44), Jacob McDonald (fly – 48.97), and Adam Chaney (free – 44.83) as they finished in 3:13.68. Carmel Swim Club’s silver was highlighted by a 47.48 fly split from Drew Kibler. SwimMAC rounded out the medals, with William Chan throwing down a 53.55 breast split to help them earn a podium spot. I timed the 50 free split from last night and have around 21.4. 8 strokes the first 25 is unreal. I am predicting 22.0 tonight for Gretchen Walsh. Hoping she sneaks under 22. A 21.9 for a 14 year old would be awesome! The 13-14 NAG would be faster than the 15-16 NAG!!! That’s crazy. Hadn’t even thought about that! I’ll have to look and see if that’s happened before. Maybe in the case of someone like Franklin. Look like that’s happened before with Franklin and Ledecky. Possibly others. Another example would be Phelps. 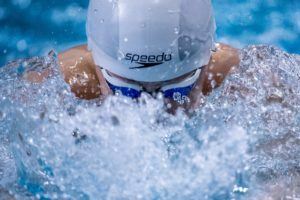 Since he broke his first World Record when he was 15, by definition that would be faster than the 17-18 national age group record. Agree, I got 21.4 on 3 different viewings. Which is still bonkers fast for 14. Live stream or just the West is being live streamed? Unfortunately we’re not seeing a live stream for the east but I’ll update if that changes! Thank you. Makes no sense to me. Accidentally hit the post button 2x. 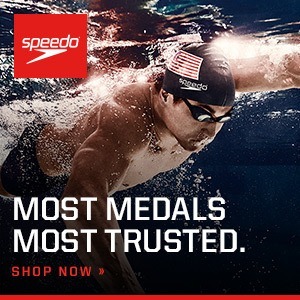 It looks like east now has a live stream on the USA swimming home page as well! I’ll put the link in the article, but if you go to usa swimming it’ll be right there. Is this going to be streamed live?